When choosing Outdoor Furniture, it is important to consider; Comfort, Material, Colour, Space, Maintenance and your Budget. 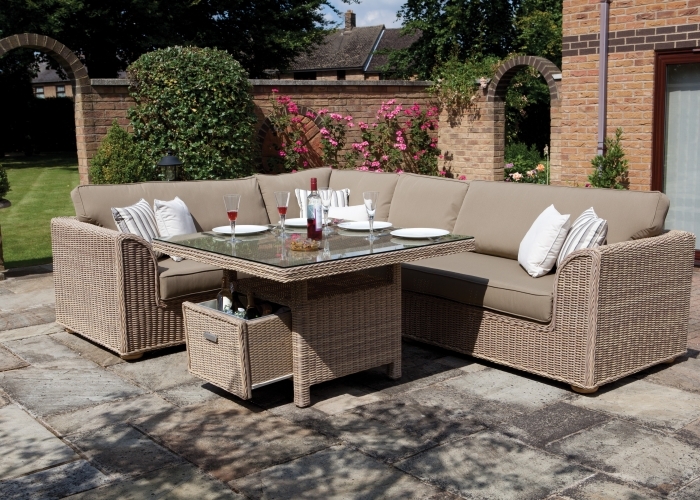 With over 40 years’ of experience as the leaders in woven rattan furniture, Daro Outdoor Furniture is made to the highest specifications and comes with a 5 year guarantee on all products. Possibly the most important factor of all, ensure you try before you buy. Cushion pads can be added to most frames to create a comfortable dining experience. Metal - In the form of treated wrought iron, it can stand up to all-weather but must be maintained to prevent rust. All-Weather Wicker – This is typically made from synthetic resin and can be produced in almost any colour, additionally, it can stand up to the elements. Teak – A durable, eco-friendly choice but it can be very expensive. Would you like the frames match other items in your garden? Light Brown coloured frames are popular as they add to the ‘natural’ feel of a garden and blend in well. If you would like to achieve this look, choose neutral coloured cushions. Conversely, choosing bold coloured frames and bright cushion fabrics can really help the furniture in your garden to stand out and create a statement. Often, the biggest mistake people make is buying too much! That 10-seat dining set might look wonderful in the showroom but can you actually fit it onto your patio? You can always buy a smaller dining table and squeeze a couple of extra chairs onto it. Map out the space in your Garden and take a tape measure when you go shopping to ensure you make the most of your outdoor space. Warm soapy water works for most styles of outdoor furniture. Steel & wrought iron frames need to be painted to prevent rust. Once you have decided exactly what furniture you require, estimate a budget. There are always bargains to be found and these are not exclusive to the internet, many shops & showrooms have offers, just ask!